The city of Central Falls Rhode Island cut the pension benefits of the Police and Fire Department retirees and their families after the town declared bankruptcy in 2011. In a small mill town in New England, dozens of retired policemen and firefighters are feeling the pain of what they see as a broken promise, offering a glimpse into what could happen to thousands of public workers in Detroit facing massive reductions in pension payouts after the city's declaration of bankruptcy. Bruce Ogni, 53, president of the Central Falls Police Retirees Association, won't forget that day, either. Beyond trouble covering medical bills and basic needs, former public servants say their golden years have been stolen from them. After a lifetime of working to save the lives of others, the ability to enjoy their own lives has vaporized. 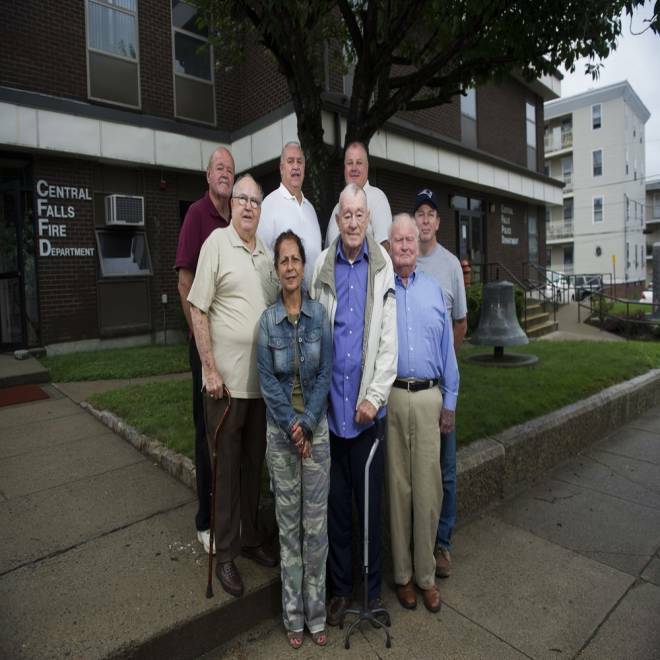 Those affected by the Central Falls cuts include, from left, front-row, retired police Sgt., Thomas E. Cawley, Jr., (with cane), Joyce Gillis, widow of retired police Sgt. Dennis Austin, retired firefighter Daniel Kelley, and retired police Deputy Chief Robert Bradley; in the second row, from left, are retired police patrolman Walter Trembley, retired fire Battalion Chief Joseph Laurie, retired police Captain Bruce Ogni, and retired police patrolman Ronald Laflamme, standing in front of the Central Falls Police and Fire stations, Friday. 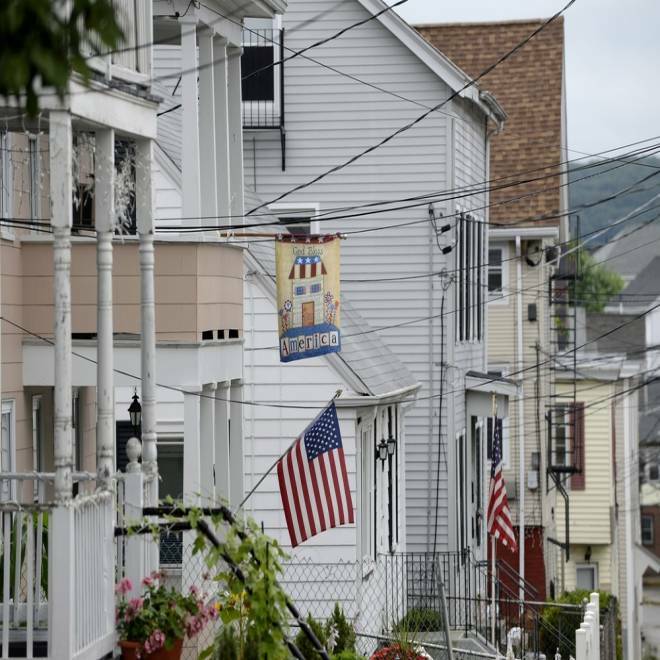 Central Falls' 19,000 residents are tucked into barely more than one square mile. The little city has coped with high poverty and crime and in 2011 found itself with a structural budget deficit of $6 million, along with $80 million in unpaid pension and health insurance benefits owed to the city’s retired workers. Cardin believes that the city owes him and his colleagues the money they deserve, and that the services provided by him and his men should not be taken for granted. 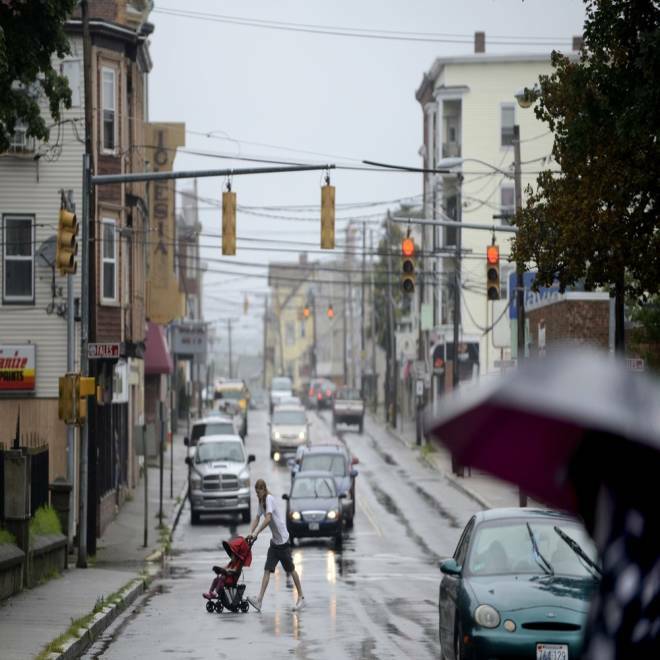 City officials tasked with rescuing the city from financial oblivion said they had no choice. “The city was running out of cash to meet its obligations and was literally going to be defaulting on obligations to run the city and take care of the retirees it was trying to pay,” said Flanders, who is now a partner at the law firm Hinckley, Allen, & Snyder. As a result, Flanders proposed cutting back on pension payments and health insurance for retired workers, asking former police and firemen to take a 55 percent cut to their annual pensions. During negotiations to avoid further litigation, the state agreed to allocate $2.6 million for pensions in Central Falls, allowing retired policemen and firefighters to keep 75 percent of their pensions for the first five years after the city filed for bankruptcy. In 2016, pensions will again be cut to 55 percent. “You have to figure out what we absolutely need to run the city. We have to have firemen, we have to have police, but we don’t need open pools, and for those who are retired, we don’t necessarily need to make those payments,” Flanders said. The cutbacks left retired police and firefighters feeling angry, betrayed, and scared for the future. Beyond learning their pensions would not be paid in full, the retirees were no longer protected by the labor union. They would have to get together and hire their own attorney if they wanted to challenge the city — an additional cost they would have to pick up. “It’s degrading to me as a man. I’m supposed to be the father in this family. We were doing OK with my pension, but losing 12 hundred a month and now her health, that’s a lot,” he said. “If anything comes up out of the ordinary, that’s money we have to take out of our savings,” said Laurie. He added that the family has already made a dent in their nest egg. Another retiree, who out of respect for his wife and children preferred not to be named, had to voluntarily surrender his home to the bank. After putting four children through private school, and with one daughter still in college, they made the choice to give up their three-bedroom home of 25 years, after the pension cuts. Flanders said he did what he had to do to save the city, and that it was impossible to sustain a culture where people work for a while, retire and get a nice pension and generous health benefits that cover everybody and their survivors for life. “The city was running out of cash. Something was better than nothing and a haircut looked a lot better than a beheading,” Flanders said in regards to the city’s retirees. “He gave us a scalping, he didn’t give us a haircut. There was no haircut. That’s his famous line,” the retiree who lost his home said, with a chuckle. A little over a year after filing for Chapter 9, Central Falls emerged from bankruptcy. “I think there’s a new spirit of optimism that has engaged the city and I think most people there would say as painful as bankruptcy was it's put us in a better place to move forward and have a brighter future,” Flanders said. Despite the city getting back on its feet, retirees still wonder how they will survive with more cuts looming in 2016.